← Synthetic Biology: Ready, Set, Go! 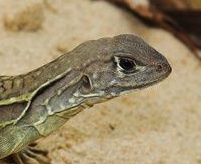 From National Geographic, see the Self-Cloning Lizard. …the newfound Leiolepis ngovantrii is no run-of-the-mill reptile—the all-female species reproduces via cloning, without the need for male lizards. Since so many people apparently think cloning is unethical (typically because it is “unnatural”), surely we must conclude that this reptile, too, is unethical?